The Iro and Buba that we once knew to be sewn in the same, simple round-neck style has now grown up to wear new looks. Thanks to the creativity of Nigerian Fashion designers, the traditional Iro and Buba style has now been modernized to various styles such as the Tulip style wrappers (Iro) and the Oleku Iro and Buba styles. If you’re looking for style inspirations to show your tailor, in this post you will see over 100 beautiful pictures of latest buba styles – the old and modern styles sewn with different fabrics, including lace, chifon, silk, good old ankara, adire tie and dye, aso-oke fabrics and more. Play the video slideshow below to see photos of the current iro and buba styles, as well as fabrics. Modern Trends in Iro and Buba Fashion in Nigeria: What is Different? What is Oleku iro and buba? What is ‘Tulip’ wrapper? The modern iro and buba styles are similar to the clothing styles that Nigerian young women (at home and abroad) are already used to, hence we are seeing many young women wearing oleku buba (tops) and tulip style iro (wrappers) to occasions, even as wedding aso-ebi. Oleku is the term coined for the ‘short-sleeve style blouse of iro-and-buba outfit WHILE ‘Tulip’ is a style of tying the wrapper of an iro-and-buba like a wrap skirt. Many young Nigerian (and even Yoruba) women dislike wearing the old style of iro and buba, saying that it makes them look ‘mama-ish’, and they are happily embracing the modern buba styles as most say that it’s so like-their-age. And the oleku and tulip style iro and buba are so youthful and more fashionable too. The tulip style of tying the (Iro) is ‘a game changer’ for the young and stylish Nigerian women who would never have been caught in the old-style, traditional Ito and Buba. If you hated wearing any type of wrapper-style Nigerian outfit, you’ll love the Oleku style Buba and the Tulip style of tying Iro (wrappers). The Sleeves: Traditional iro and buba was only sewn in round neck and wide long sleeves that reached the wrist. The modern styles of iro and buba are sewn in all sorts of sleeves styles – fitted sleeves, short and three-quarter sleeves (OLEKU buba/ tops) and even puffed, long sleeves, sleeveless and much more. By the way, oleku is the name for the short-sleeved iro and buba. The Body: The traditional buba style is loose-fitting WHILE the modern styles have been tweaked into the fitted and not-so-loose styles. You can see them in the pictures above. The Wrapper (Iro): With the old, traditional buba style, the wrapper is tied round the waist BUT with the modern style buba, thewrapper is knotted in front (TULIP STYLE). In the old buba style, In the modern iro and buba style, the wrapper (iro) length: varied – long and short, as the wearer desires. Other: In the Oleku buba style, the buba (top) could be paired with a short or long skirt. Iro (wrapper) and buba (top/ blouse), the traditional outfit of adult Yoruba women of Nigeria (West Africa) used to be sewn in only one style – simple round neck, loose long sleeves and the top (iro) is worn over a long wrapper. Iro and buba was worn at home as well as parties, but party iro and buba were tailored with more expensive fabrics such as lace, ankara/ wax, guinea brocade, lace, aso-oke, tie-and-dye adire – cotton fabrics are usually used to sew the traditional iro and buba styles. Ankara wax was (still is) popular choice of women with stay-as-home iro and buba. While the oleku and tulip style iro and buba styles are fast gaining acceptance in and outside Nigeria, especially among the young women, the classical, original style of buba is still a favourite of older women. If you’re a bellanaija fan like us, you know that every asoebibella edition has lots of oleku blouse and tulip style iro. Want More Pictures of Nigerian Traditional Fashion Styles for Wedding? 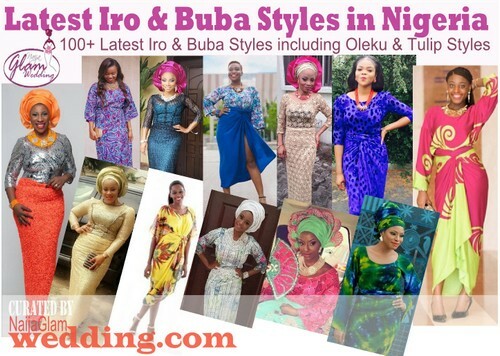 Okay, that’s it for the latest iro and buba styles in Nigeria. I hope you like them. Please, leave me a comment to tell me the one you like best. And, don’t forget to share this post with your friends – facebook it/ tweet it/ email it.